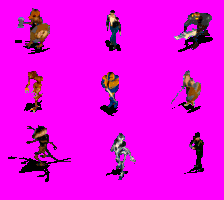 Those are from library of Clickteam's game design tool The Games Factory, containg 9 characters. Most of them are scientific characters. There are also a warrior and a demon. Except Alien, all have original and player colored versions. I'm using the alien, the way he walks is kind of crazy, right? Yes, aliens have singular motions. All characters are scaled smaller to fit to empires. So icons might be created from original sprites. Thanks for sharing too! I could use more of this characters for my new mod!